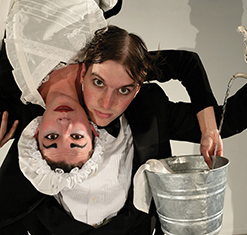 Amica Hunter and David Cantor are co-founders of the theatrical circus entertainment company: A Little Bit Off and their latest show couldn’t be more ON. Maid and butler to the incorporeal owner of an Edwardian manor, Hunter and Cantor’s characters are charged with the daunting task of cleaning the interior in preparation for some forthcoming guests. Never before has cleaning been so casually acrobatic and playfully funny. With just a little imagination, the house becomes so much more than its walls, and the cleaning supplies so much more than their cleaning purpose. As their chores and imaginings take them through various hilarities, the two servants walk a tightrope between working together and working against one another in this classic slapstick piece of physical theatre. Some wonderful costuming details include the butler’s impressively ridiculous hair – like a wannabe crown – and the maid’s feather duster – more often an aesthetic hairpiece than a hand held cleaning implement. The implication is, I gather, that there is a kind of power being drawn from these symbols of financial wealth and status, since fluffing up these features of their attire momentarily self-assures each servant before they get back on track with their tasks. Oh and I mustn’t forget to mention the other characters that make an appearance in this show – Stu and the rats. Forget SpongeBob SquarePants, Stu will be your new favourite lovable sponge friend. The rats on the other hand, provide not only recurring fun in various inventive games, but serve a more nightmarish function as well. One rat episode in particular illustrates the butler’s development from treating a certain rat with fear to challenging it head-on. The lesson? Your imagination may make your responsibilities more fun, but it may not necessarily keep you safe. Bella Culpa is some seriously talented physical theatre. The show is sly, flirty and packed with lively audience participation. It will leave you wanting more.